We are frequently asked what is coasting by drivers or learner drivers. The fact is, many drivers don’t even know that they are coasting. It is also a habit that learner drivers acquire on a regular basis and one that needs remedy. Excessive coasting can potentially fail a driving test as it can be dangerous. This article will describe what coasting is when driving, when stopping and the impact it has on the driving test. The correct procedure to prevent coasting is explained among other frequently asked questions. Coasting essentially means to move, either a person or vehicle, and make progress without using power or as little effort as possible. In terms of coasting when driving, it means keeping the clutch depressed so as to free-wheel and not use the engine to move. 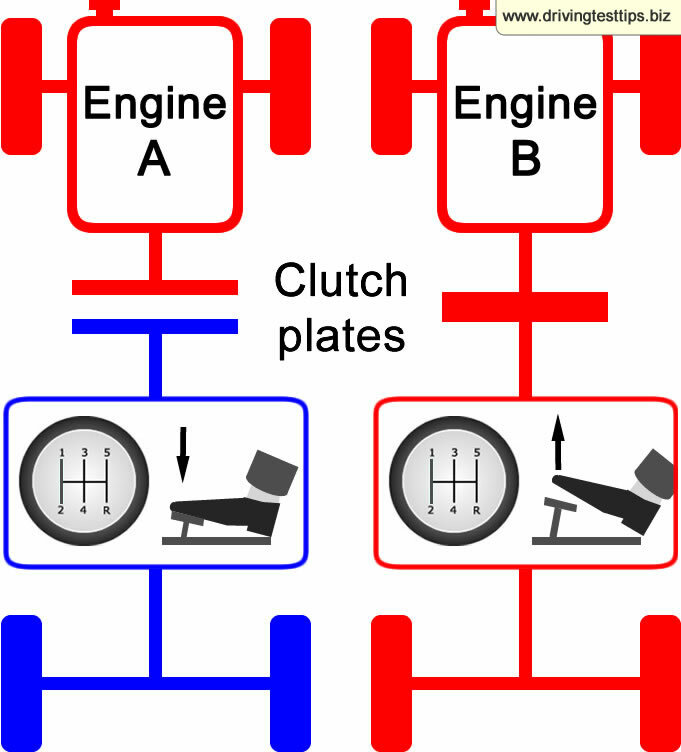 The diagram shows how the engine is disengaged when the clutch is depressed. Engine A shows when the clutch is depressed it disengages the engine, effectively making the car free-wheel. Keeping the engine engaged in Engine B allows the car to slow down using the engine, reducing wear on the brakes and increasing control of the car making it safer. keep the clutch depressed whilst turning at junctions – making a left or right turn off a main road into a minor road. depress the clutch too soon before coming to a stop. keeping the clutch depressed too long after changing gears. Coasting is potentially dangerous as it leads to less control of the car. Keeping the clutch depressed whilst making a left turn for example essentially turns your car into a free-wheeling go-cart as the engine is disengaged. The engine when engaged, helps to increase breaking and therefore increases control of the car. There are often times that the need to accelerate can prevent a potential accident from occurring. A car approaching you from behind at speed for example or a car pulling out just as you are passing. Coasting that involves leaving the gear stick in neutral will prevent you from using the accelerator if such a situation occurs. As coasting is potentially dangerous, it stands to reason that it is taken seriously by examiners during the driving test. Most learners don’t fail a driving test due to coasting as a driving instructor should pick this up and deal with it before the test is taken. Each and every test examiner has their own methods of dealing with correct procedures within a standard set of rules. So what one examiner deems as coasting, another may not. A little coasting here and there such as putting the clutch down a little too early before a stop occasionally will not fail a test but impose a minor or two. Heavy coasting such as consistently depressing the clutch whilst making turns or setting the gear stick into neutral before the car has stopped will certainly result in a failure. The very fact that you realise you’re coasting is a good start. Coasting on left and right turns take practice to remedy. A good driving instructor will be able to assist. Taking a left turn for example, the speed or gear at which you are traveling on the road before the turn takes place doesn’t matter. When you see your left turn, you will need to cover the clutch (place your foot on the clutch but don’t press it) ready to depress it and at the same gently apply pressure on the foot brake. Keep applying pressure until you reach an appropriate speed for the turn. Most left turns are made around 5 mph to 10mph in 2nd gear. Around 10 meters from the turn, depress the clutch and select 2nd gear, then gently take your foot off the clutch but remain covering it as you may need to depress it due to not knowing what is round the turn. Keep the brake and clutch covered whilst taking the turn. When coming to a stop in your car, to prevent coasting, as above, cover the brake and clutch. Keep gently applying pressure to the brake. Good braking techniques such as progressive braking makes for safer driving, and reduces wear on braking systems and tyres. You do not need to change down through all the gears as this is an old technique that is no longer used in modern driving tests. As you reach around 4 to 5 meters from where you intend on stopping, depress the clutch and select 1st gear. Keep pressure applied to the brake. If you remain stationary for around 5 seconds or more, apply the handbrake. (You can remove your foot from the foot brake now if you wish). Coasting is not directly illegal or against the law. Circumstances of a situation however could lead to prosecution due to coasting. If you are involved in a car accident and you were coasting at the time by having the gears in neutral, if it was found that the coasting participated somewhat to the accident, it could be deemed that the driver had a lack of control of the vehicle due to coasting. Coasting significantly increases the load on your brakes as your car isn’t using the engine to help slow down. More braking is required and this will wear the brake pads and brake discs of your vehicle at a much higher rate. New brake pads and discs can easily cost upwards of £200 depending on the make and model of your vehicle. Coasting is basically the same as a stationary car with an idle engine. An idle engine uses a small amount of petrol to keep the engine active. When slowing down in a modern car by keeping the clutch up and in gear cuts the fuel injectors and uses no petrol at all.